Well, today is the second day of sneak peeks from REVERSE CONFETTI. We have some inspiring projects to show off today as we continue to share our new stuff available on November 8th! 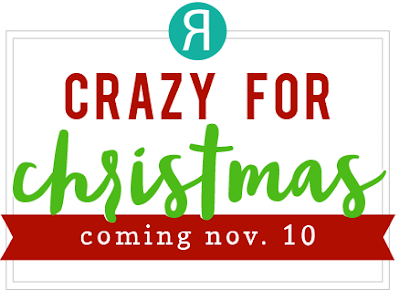 ***Side note***---stay tuned for our next online event coming November 10th! This tag is brand new and comes with a nice sized tag and these fun "toppers" that layer onto the side like I've done here and there's also a coordinating piece that can go across the top instead of down the side to accent your tag. I decided I wanted to make something that could hold some Christmas cookies to add my tag to, so I cut the mini milk carton from my Silhouette and put it together. It's perfect for the tag! I used my HANG UPS Confetti cuts made from that silvery glitter paper to further embellish where the tag ties onto the bow, along with last month's fabulous HOLLY Confetti Cuts. I've started my TOPPED OFF TAG by cutting the main tag out of red, and the "topper" layer from white. I wanted a different paper to show through my "topper", so I simply cut another tag from the green dot, glued on the topper, and trimmed it to be the same size. Then all I had to do was glue that piece onto my red tag. Of course it wasn't complete without the fun "fresh baked with love" sentiment from the new WITH LOVE stamp set also available on November 8th--not much longer! We have lots more sneak peeks to share tomorrow, and then get ready for one more inspiring dose of creativity when we present our new release BLOG HOP on the 8th. Then, everything will be available on the 8th. Don't forget that Jen has a link list going daily (NOVEMBER 5-8) for all the sneak peeks over on the REVERSE CONFETTI blog HERE. Your treat carton and tag: simply lovely! WOW...I'm convinced these are 'must have' tags! Love the treat box and tag together! Oh!! Love your carton so much!! I love the dark holly leaves too!! Such fun packaging, I love it! This packaging just says happy! Absolutely love the festive tag on the box!! Gorgeous! What a beautiful presentation! The tag sets it off! Yes, a really nice gift with the fun tag...I had forgotten the 'Fresh Baked' part of the stamp set. Fun and colorful! Great way to showcase that tag! Love the milk box all by itself but adding the tag makes it fabulous. Oh my gosh...so cute! Cant wait for the release! your milk box is so pretty! and your tags awesome! Great tag!! Love the bright colours. Yes Yes Yes, I would love to win some RC. Their products are first rate! I need the Gift Card Pocket for sure. Lovely gift set, Susan! Can't wait to order goodies from the new release! Using the bag paper as part of the background on the tag was a good idea. You are one of my very favorite designers! Your projects are always so bright and colorful, and they ALWAYS make me smile! These are amazing too! LOVE it! These tag dies are so fun and we all need to use more jingle bells. 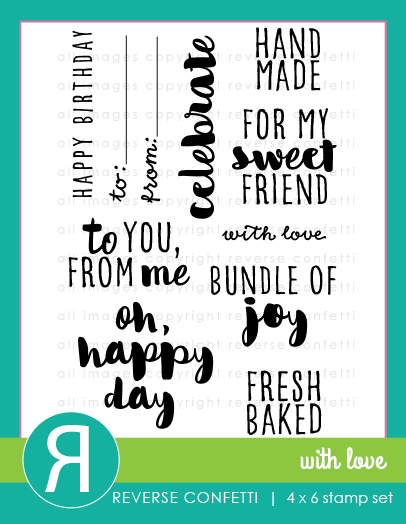 I love how you layered the sentiments and this is just the cutest gift EVER! WOW love your gift box! The tag is so cute! Oh so so cute, love this little tag! 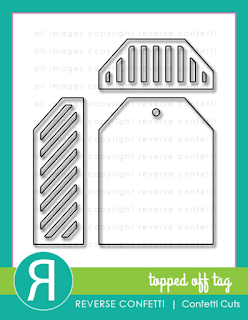 It will be very versatile on packages and cards! I love the jingle bells. Gorgeous how you packaged this and added all the embellishments. Adorable! Great idea for gift giving...Love it!